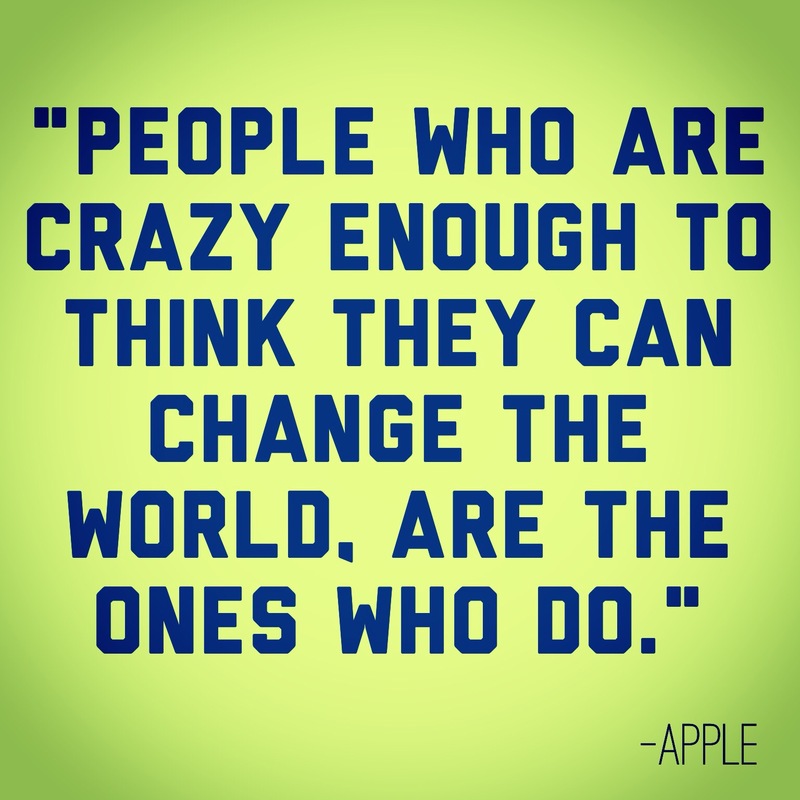 Be Crazy and Change the World! At a time where our world is rocked every day with violence and the murder of young children and babies, we dread waking up to the barrage of horrifying news.. Each day I wonder what I can do to make a difference in this world filled with suffering. It seems like a lofty goal, but I am convinced that we can all do small things that costs next to nothing and yet will make a huge difference in someone’s life. All of us have an abundance of winter coats and gloves that we never use and yet they never leave the dark corners of our closet. That same closet is bursting with clothes we haven’t worn in a decade and what good are they doing us? Have we ever thought about helping out at the local school or church for just a few hours a week once in awhile? None of that costs you anything but a little bit of your time. We are born with a responsibility to serve in any capacity that we can. Many of us sit around and wait for the world to give back to us and yet if we all do one small act of kindness each day, we will get back the best gift of all…..the joy of seeing the smile on someone’s face when you have reached out to them. Community outreach has been a part of our world since Jesus ministered to everyone in need and we need to show our thanks for all the blessings in our lives by helping others. We CAN change the world if we are willing to do something crazy and uncomfortable and change ourselves. We need to learn how to reach out to people, including those we will never meet or to someone standing on a corner, barely surviving in the freezing cold. It is not our place to judge why they are standing there and why they are not working. It may be a veteran with mental health issues or a young parent struggling to survive with their family. Do not judge, just reach out and willingly help them. We have a roof over our heads, a warm house and food in our belly. How do we compare that to what they have in their lives? Clean out your closet, mail your leftover Halloween candy to soldiers across the world, and purchase a few extra toys to give to kids who won’t get anything at Christmas. Help out at your church in the ministries that they sponsor, and help with fundraisers at your local school whether you have kids attending there or not. Pay it forward by sharing random acts of kindness, like buying the person behind you a cup of coffee or paying for the groceries of someone struggling to pay their bill or just help your neighbors rake their lawn. Will you miss the money or time you spent helping people on your last day on earth? No, not at all. But you will have changed the life of another human being in a small way. You will have changed this crazy world, one small act of kindness at a time.